Last week I wrote about the Milwaukee Brewers pitching in 2013 and in today’s second installment, I will cover the team’s hitting in 2013 and look forward to where the crew stands headed into next season. The team had 19 different position players swing a bat throughout the course of the season. Let’s take a look at how they fared. First base was particularly manned by Alex Gonzalez and Yuniesky Betancourt early on with Corey Hart and Mat Gamel lost for the season with knee injuries. Gonzalez put on a woeful display at the plate, hitting just .177 in 113 at bats with 8 RBI. Gonzalez, who has been primarily praised for his excellent shortstop play, never really seemed to get things going before being released by the Brewers on June 3rd. Betancourt found himself as the team’s regular first baseman, and he delivered early on. Yuni hit .280 in the month of April with 6 home runs and 21 RBI. Bloggers and stat freaks all throughout Wisconsin were amazed at the impact Betancourt’s bat had in the lineup and thought for a short period of time that he might be able to put together a solid season. In true Yuni B fashion, however, the veteran returned to form, hitting just .190 in May. Yuni finished at .212 for the year with 13 home runs and 46 RBI. Yes, he had nearly half of his home runs and RBI in the month of April alone. On the same day the club cut ties with Gonzalez, they acquired the powerful Juan Francisco from Atlanta. Francisco came in with a reputation for hitting the ball hard, but rarely getting on base. He lived up to that reputation in the following months with the crew. Francisco did manage to slug 13 home runs, good for third on the team, but struggled mightily, hitting just .221 overall and getting on base at a miserable .300 clip. The Brewers called up Sean Halton from AAA Nashville on June 26th for his first of three stints with the big league club to pick up first base duties after an impressive showing with the Sounds where he hit .288 with nine home runs to start the season. Halton showed flashes of power and played decent defense at the position while hitting .238 overall. He brings some versatility as he also spent some time in left field. It is doubtful that the club sees Halton as a long term solution at first base, however, but more as a bridge to the anticipated arrival of Hunter Morris down the road. I think it is in the best interest of General Manager Doug Melvin to bring Corey Hart back for 2014 and see what he still has in the tank before looking to Morris in the long term. Mat Gamel was lost on waivers to the Cubs shortly after the regular season ended and we wish him the best as he tries to put a full season together. Second base was manned by two players throughout the season for the Brewers. Rickie Weeks continued to under perform at the plate and faced his usual amount of scrutiny as he hit just .209 and saw a significant drop in home runs, clearing the fence just 10 times. He was lost for the season after having surgery to repair a torn hamstring in early August. Heralded prospect Scooter Gennett was handed the reins to the second base job and didn’t disappoint. Scooter hit .324 for the season and put up surprising power numbers, belting 6 home runs in his limited time in the starting role. He plays good defense and is just 23 years old. I see the Brewers entering 2014 with Gennett as the starting second baseman, even if a healthy Weeks returns. Look for Gennett to hit around .300 and play with great energy as the every-day second baseman. Third base, much like first, was another position where injuries plagued the Brewers in 2013. After a terrific season in 2012 where he hit .300 with 27 home runs and 105 RBI while garnering a great deal of attention on defense, Aramis Ramirez played in just 92 games in 2013, hitting .283 with 12 home runs and 49 RBI. Ramirez is under contract for one more season with the crew, but will be 36 in June and certainly has his best years behind him. If the club is to contend in 2014 however, a strong, healthy season will be needed from the veteran. Jeff Bianchi, who played some shortstop as well, was the primary replacement for Ramirez and hit .237 with just one home run and 25 RBI while appearing in 100 games, but did particularly well in the second half of the season, hitting .274. Bianchi is fine in a bench role, but I don’t see him as a long term solution for the Brewers at any position. Nick Delmonico, acquired from the Orioles mid-season for Francisco Rodriguez shows a lot of promise and could be the club’s future third baseman, but is just 21 and remains a couple seasons away from the major leagues. I applaud Melvin for going out and getting a guy of value for Rodriguez when he had the chance. Shortstop was a bright sport for the club in 2013 thanks to the emergence of Jean Segura. Another piece acquired by Melvin in a trade, Segura appeared in 44 games with the crew at the end of 2012 after being acquired in the Zack Greinke deal at the deadline. Segura showed flashes of brilliance, batting .294 with 12 home runs and 49 RBI while finishing second in the national league with 44 stolen bases. He was also impressive on defense and made his first All-Star game after hitting .325 in the season’s first half. While his numbers did drop off significantly in the latter half of the year, the organization is hoping the amount of baseball Segura had played without time off is to blame. However you look at it, the club has to be excited about their future at shortstop, as Segura is just 23 and currently locked up through 2018. The Brewers entered 2013 feeling confident that they had one of the better pairs of catchers in the national league. Jonathan Lucroy, still just 27 and despite an injury shortened 2012, was coming off his best season in the major leagues, and the emergence of youngster Martin Maldonado was certainly something to be excited about. While Maldonado faced his share of struggles at the plate, Lucroy continue to show he belongs in mention with the better catchers in all of baseball. Luc proved to be the veteran leader of the club after the loss of Ryan Braun and put up the numbers to support it. He hit an even .280 with 18 home runs and 82 RBI while playing in 147 games. The club primarily used Maldonado to catch rookie Wily Peralta and he struggled to hit just .169. Lucroy proved his leadership by requesting that manager Ron Roenicke play him at first base on days that he wasn’t catching. Roenicke gave it a try and Lucroy was able to show enough at first that the crew felt comfortable enough to run him out there multiple times. In addition to their offense, both catchers again proved to be valuable behind the dish. Maldonado has developed a reputation as one of the better throwing catchers in the game and Lucroy is commonly mentioned among the best in all of baseball at framing pitches. Look for Maldonado’s numbers to improve in his third season and Lucroy to remain right around the .280 mark and provide solid leadership. After terrific seasons from Norichika Aoki and Carlos Gomez in 2012, the Brewers felt they had one of the better outfields in the national league heading into 2013 with a healthy Ryan Braun. 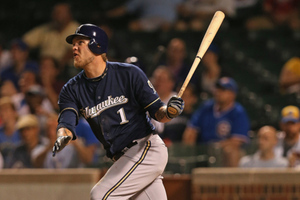 This quickly changed as Braun appeared in just 61 games before a season ending suspension due to his involvement with performance enhancing drugs. Braun was good in the limited playing time he had, hitting .298 with 9 home runs and 38 RBI but didn’t seem as lively on the base paths as he has been in years past, swiping just 4 bases. He will return in 2014 with much to prove to a fan base that greatly needs another MVP like season from the slugger to regain their trust. Aoki was solid again, batting .286 with 8 home runs and 37 RBI while stealing 20 bases but is a big question mark moving forward. The Brewers can choose to pick up Aoki’s option and keep him in Milwaukee for 2014 or allow him to become a free agent and sign elsewhere. This will likely be a tough decision for Melvin and company as Aoki has been nothing short of impressive and on a very team friendly deal for the past two years. That being said, the club has a number of impressive young outfielders banging on the door and ready to play regularly in the big leagues. Aoki will be 32 in January and one can only wonder how long he can keep up this type of production. Carlos Gomez signed a three year extension good for $24 million in March thanks to his impressive 2012 and responded by having an even more impressive 2013. Gomez got off to an incredibly hot start, hitting .295 in the season’s first half and clubbing 14 home runs while playing the best defense among center fielders in the national league. His second half numbers weren’t quite as impressive, but the gold glove favorite still finished with a .284 average, 24 home runs and 73 RBI while stealing 40 bases and robbing multiple home runs in the outfield. He enters 2014 at just 28 years of age and expectations to hit .300 and once again provide good speed and pop. Logan Schafer, Caleb Gindl and Khris Davis were three youngsters looking to make an impact on the major league club for the first time in 2013. All three proved they deserve a look at a possible starting job moving forward and leave the Brewers pondering whether to exercise Aoki’s option. Davis was particularly impressive, appearing in just 56 games but smacking 11 home runs. The left fielder got a particularly long look thanks to the suspension to Braun and wowed players, coaches, and fans with his impressive display of power. In addition to the home runs, Davis hit .279 and drove in 27. His defense is not something be excited about, however, and he seems confined to left field. Logan Schafer appeared in 134 games and hit just .211, but showed great promise with speed, hustle, and an ability to make plays on defense. Caleb Gindl was criticized early for his struggles in the outfield and needs to get a handle on his defensive skill set, but was fairly impressive at the plate. The 25 year old hit .245 in the season’s second half with 5 home runs and 13 RBI. His defense needs to improve a great deal before he can be considered an every-day outfielder, but he has at least earned himself consideration for a bench spot heading into 2014. I think it would be best for the crew to allow Aoki to sign elsewhere and attempt to move Ryan Braun to right field. While it will be sad to see Aoki go, I feel the benefits of having Khris Davis play every day will be worth it. If Braun can make the switch to right, the club can play Davis and Gindl in left and have Schafer back up Gomez in center. Look for good production out of this group as all three regulars could hit 25 home runs in 2014. If the club can manage to bring back Corey Hart, I don’t think much is needed in the way of free agency from a hitting perspective heading into next season. This is a club that will lean heavily on its young stars in 2014, but they have proven they can produce.